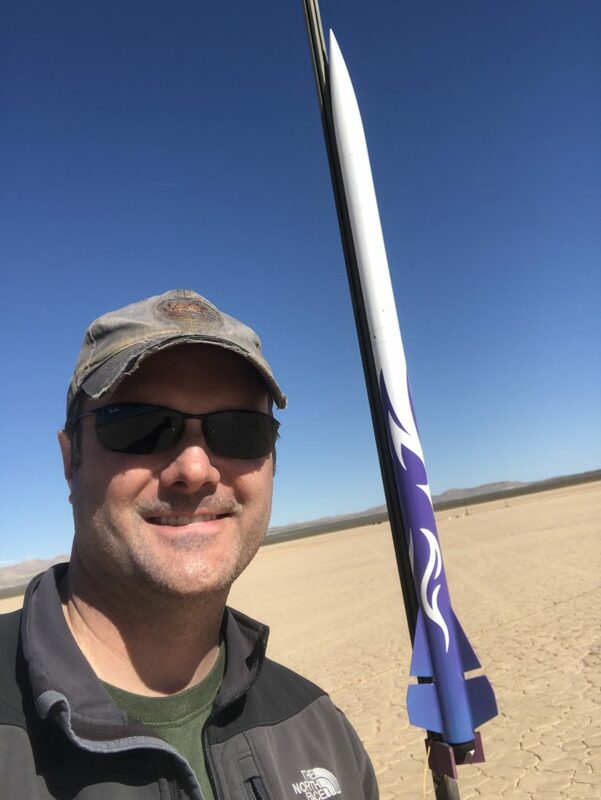 After way too long with rocket building, painting, paint removing, repainting, and ground testing, I finally flew my Madcow Rocketry Broken Arrow 54 today. To keep it in sight (so I could use my eyes to verify everything worked – or see what didn’t), I flew it on an Aerotech I140W motor. That configuration had a predicted max altitude of about 3000 ft, a top speed of 480 ft/s (Mach 0.42), and a max acceleration of 8.5Gs. The winds were light early in the morning, but they started to pick up by the time I launched. With roughly 10mph winds on the surface, I was well within comfortable limits for a first launch. Based on other flights, I expected higher winds shortly after launch. 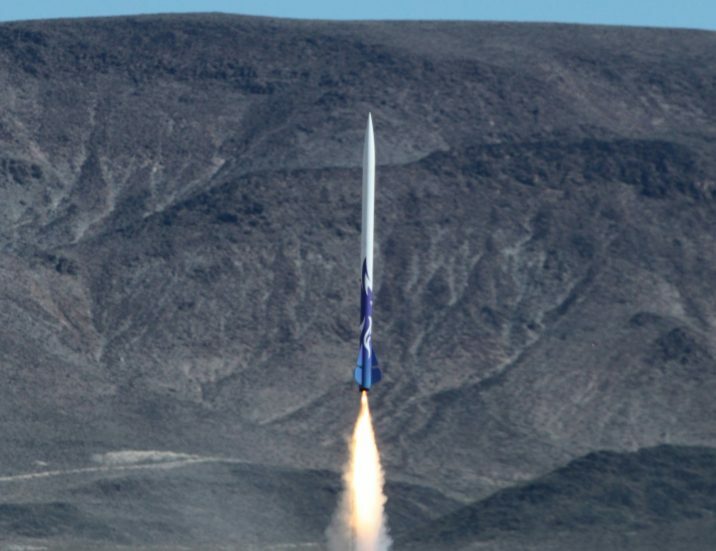 The I140 rocket motor is a mid-sized Level 1 motor with a fairly tame burn curve. 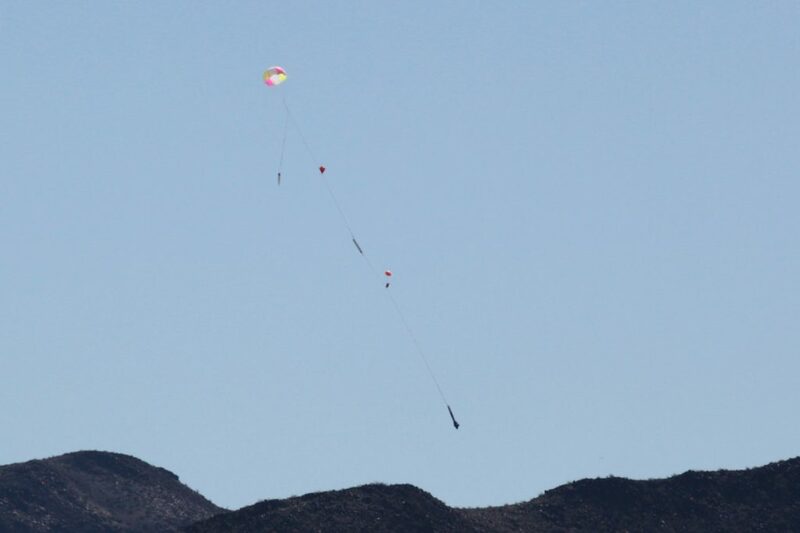 The relatively low launch acceleration meant it wasn’t going anywhere near full speed when it hit the higher winds a hundred feet or so off the ground. 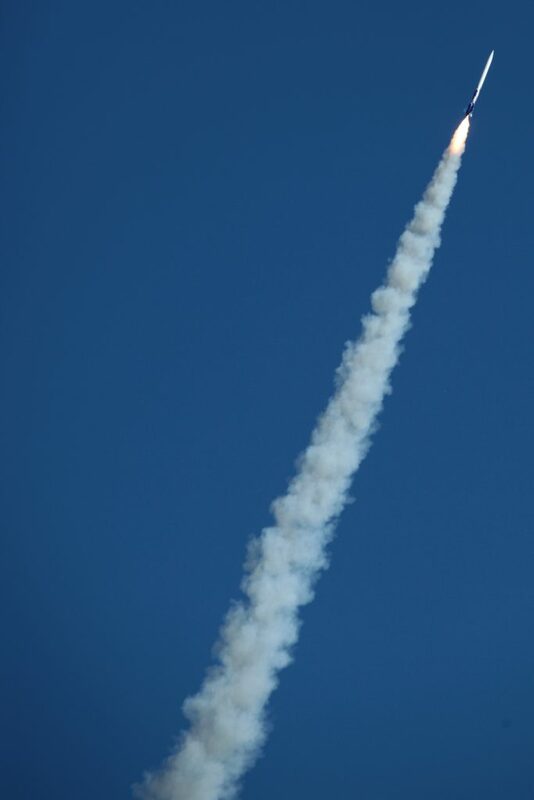 Still, aside from a little tail waggle through the winds, the Broken Arrow launch looked great. 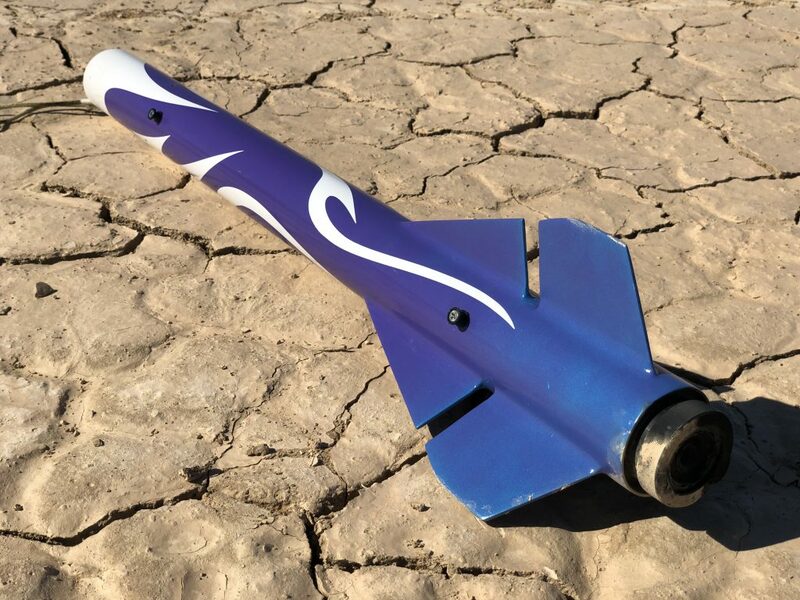 Dual-deploy recovery was accomplished with a 1.0g vinyl tubing charge at apogee with a 12″ Topflight Thin-Mil chute and a 1.4g charge at 700 ft AGL for the main chute, a 42″ lightweight Spherachute. The drogue (booster) section had a single 0.060″ Styrene rod as a shear pin. The payload section had two 2-56 nylon screws pushed into holes on opposite sides of the rocket. The 1.0g charge on the drogue has a solid, but nice separation. The 1.4g main charge is very energetic. I’ll probably do some testing to lower this down in the future. A 1.2 or 1.3g charge is probably about right. The vinyl tubing charges get great burns and seem to produce considerably more pressure than glove fingertip or other charge containment methods. 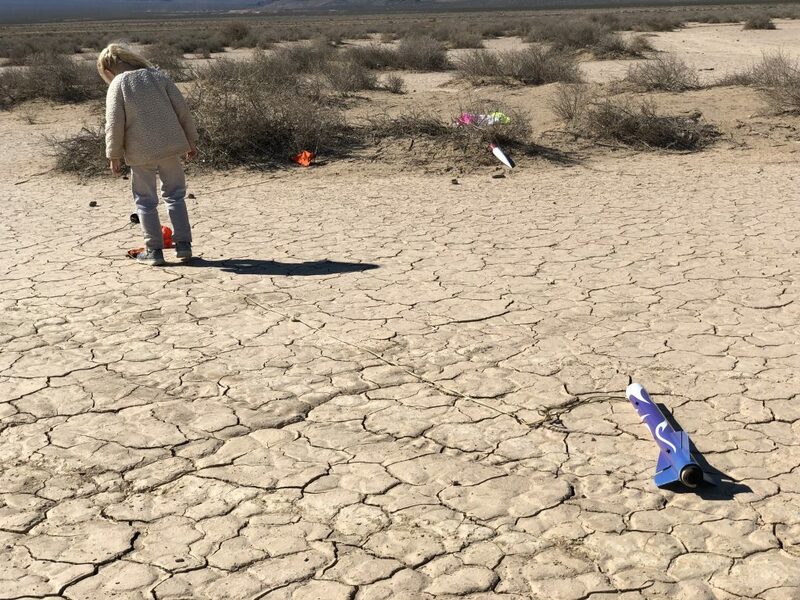 Landing was about 1200 ft away at the southeast corner of the lakebed. My daughter was my recovery team and she gave it a full inspection for damage. Overall, it was a conservative, but fun first flight. Bigger motor next time! Update: Here’s the data from the Quantum flight computer. 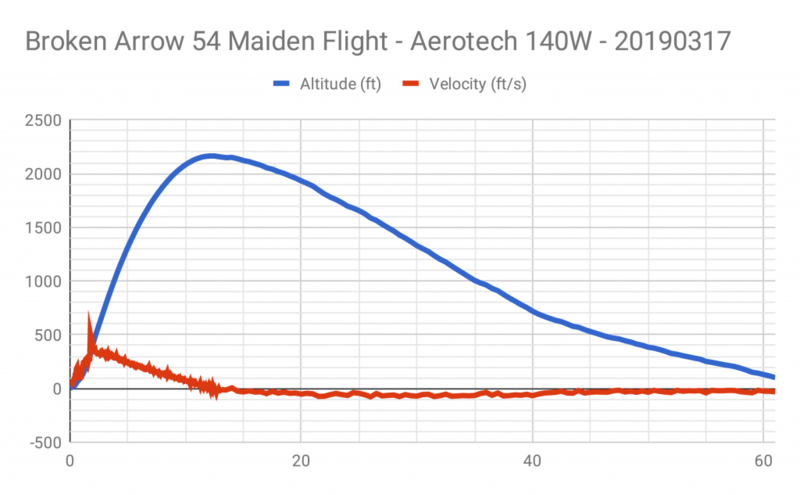 The velocity data look strange – there’s a big spike about a second before the motor should have stopped, then a deceleration fairly consistent with a motor that’s burned out. The max altitude was about 900 feet lower than expected (2100 vs 3000 ft). So, hmm. I’ll dig into the GPS logs to see if there are any differences and watch what happens on future flights.